Even though the second game in this series lacks an official movie tie-in, Dynamite Deka 2 / Dynamite Cop is basically “Die Hard on a Boat”. In turn this was technically the plot of Speed 2: Cruise Control, a movie best forgotten, and a concept that this silly little video game executes to far better effect. 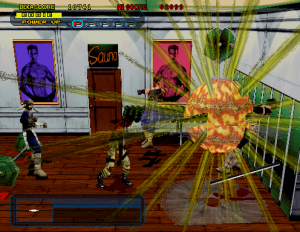 Wolf Hongo is back, and his group of “modern day pirates” have hijacked a cruise liner, which – of course! – just happened to be ferrying about the president’s daughter. (It appears to be a different girl this time, at least.) 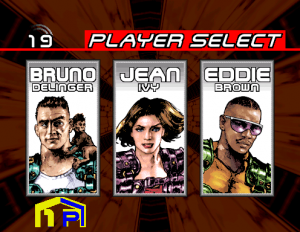 This time you have three different characters to pick from – Bruno Delinger, Jean Ivy, and Eddie Brown, and while they technically have different movesets, there’s not really a huge difference between them. At the beginning, you can also pick three different approaches to infiltrate the submarine – you can jump out of a plane and parachute onboard, take a speedboat and grapple onto the side, or scuba dive straight into its lower decks. 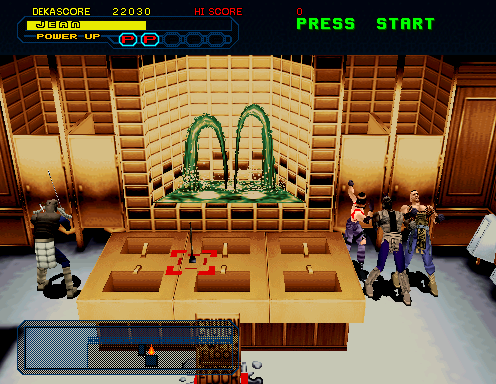 The route will determine the path throughout the rest of the game, and while each path shares some of the same rooms (and the same bosses), there are unique areas in each route, so you need to play the game through three times to see everything. 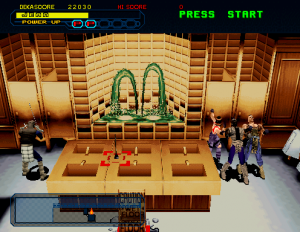 There are four stages in total, plus a final boss fight, leaving a single playthrough slightly shorter than the original, but it’s a much larger game overall. 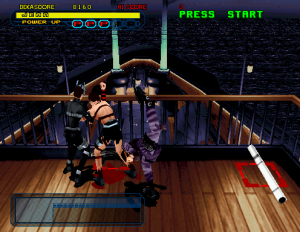 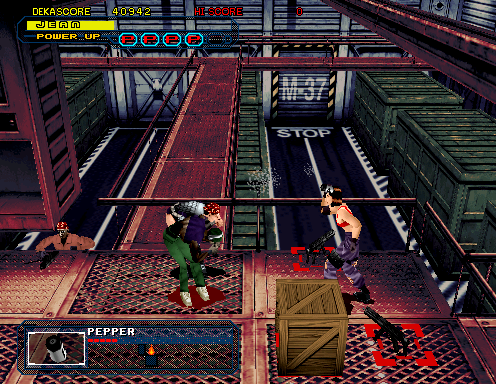 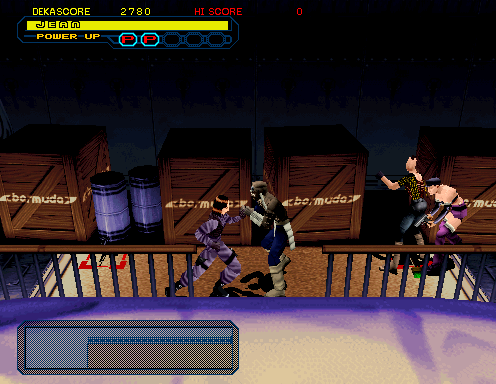 For the most part, the fighting work very similar to the original. 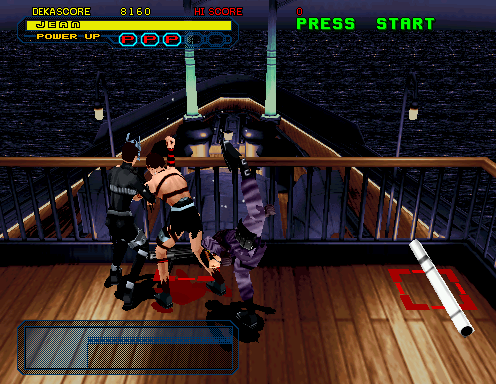 You can now face and attack in all eight directions instead of just left and right, and there are a number of cool grappling suplex moves that are easy to pull off and immensely satisfying to watch (and listen to, given the exaggerated bone-breaking sound effects.) 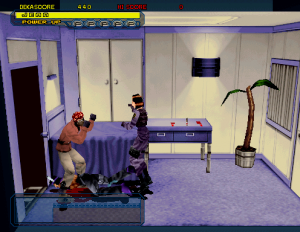 You can also pick up disabled enemies and use them to whack other bad guys, a bit like the Kunio games. In addition to the numerous weapons, there are also “P” icons, which will grant your character additional strength for a short amount of time when you collect enough of them. 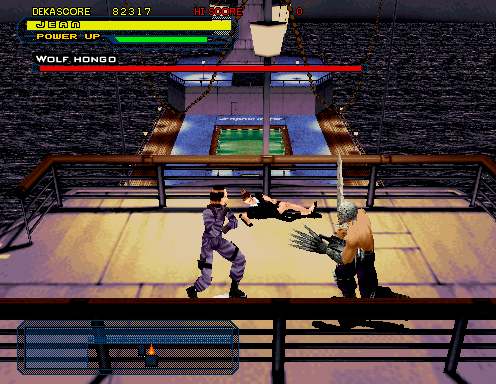 The game runs on the Model-2 engine, meaning a rather substantial visual upgrade compared to the original. Unlike the first game, this one was developed entirely in Japan, although the music is once again supplied by Howard Drossin. 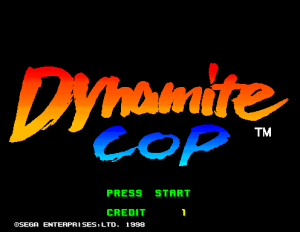 While the first game was fairly faithful to the style of American action movies with a bit of Japanese arcade-game silliness, Dynamite Cop takes everything much further and joyfully revels in absurdity. 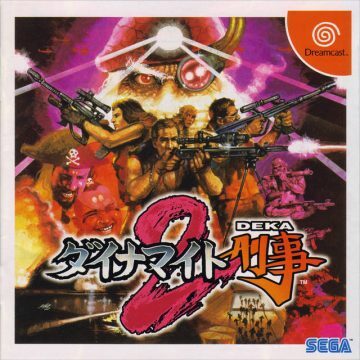 The rocket launchers and anti-tank rifles in the first game were fun, but this game has ship-to-ship missiles which blow up enemies with miniature mushrooms clouds. 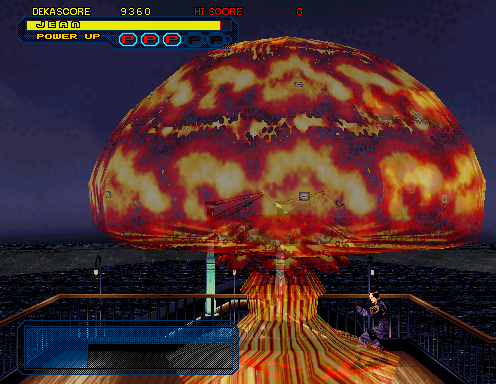 Even fairly innocuous objects like soda machines and arcade cabinets will explode upon impact when thrown. The game takes the theme of “modern day pirates” a little bit too literally, with most of the terrorists dressing like they stepped out of a theme park. 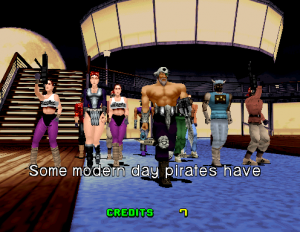 In addition to the guys and gals dressed in garish neon ascots and ridiculous eye-patches, you’ll find people in shark outfits. 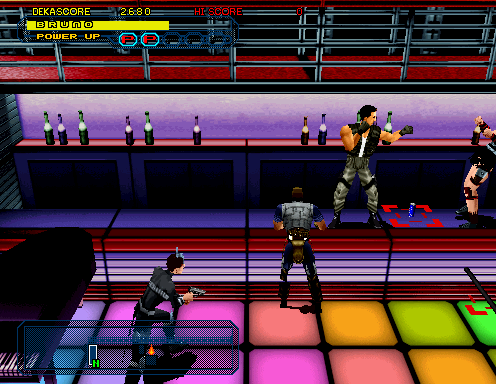 Throughout the ship, you’ll fight enemies in a nightclub, in a casino, and a gym. 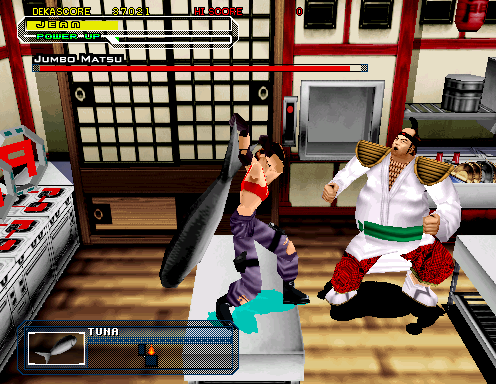 You will fight a gigantic sushi chef while wielding an enormous tuna. 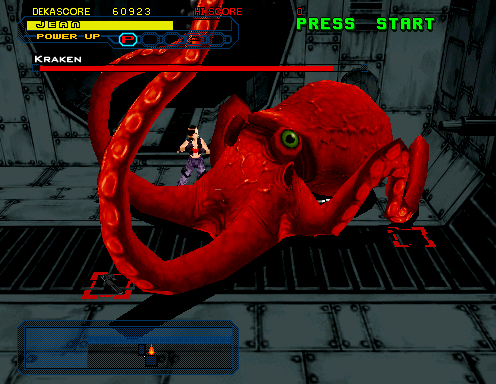 At some point you will fight a gigantic octopus. The final battle is, again, a fist fight with Wolf Hongo, although this time he’s modified his body with cybernetic enhancements and can shoot lasers out of his eye. It’s the sort of thing that acts as both a loving emulation of action movies and a gloriously over-the-top parody. 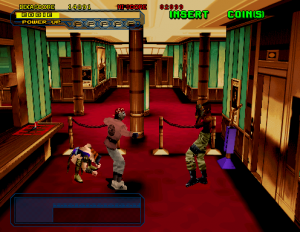 Dynamite Cop was ported to the Dreamcast, although the upgrade in hardware didn’t do much to the visuals other than displaying them in a slightly higher resolution. All of the cutscenes have been pre-rendered at a higher quality though. 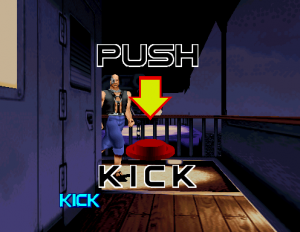 A few minor things have changed in these, like the president’s daughter now hiding in a bright pink suitcase rather than beneath a desk. 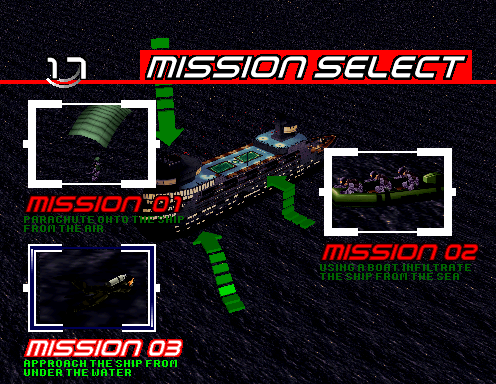 Upon completing all of the standard courses, you can also unlock a second, more difficult set of missions. 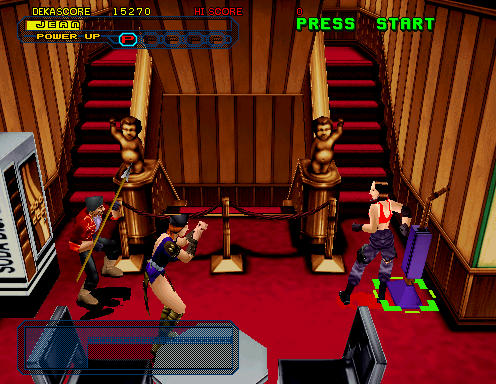 There are also a number of extra costumes for the characters. 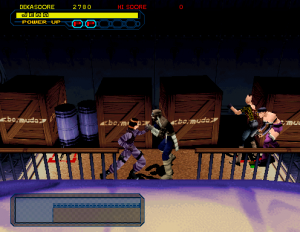 The game can also be upgraded to version 1.1 using a special save file, which allows you play as Caroline, the second player character from the first game. 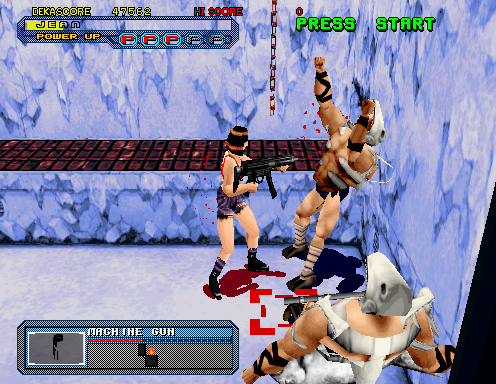 When the game was initially released, you were supposed to get this save either through a disc included with a magazine, or through downloading it straight from the official website. 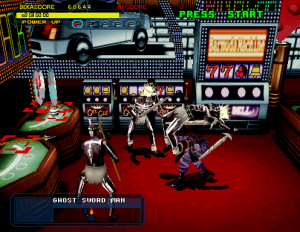 Nowadays, the easiest way to obtain this is to download Dream Explorer, a fanmade disc full of pretty much every save game for every system and load it onto your VMU. 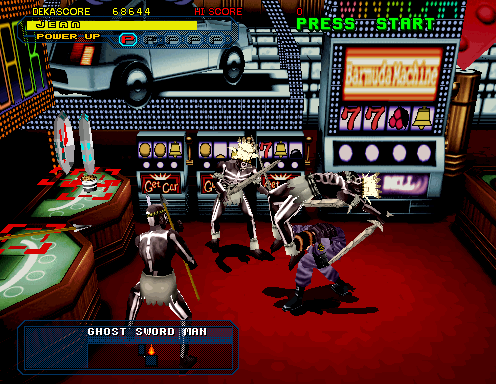 Like the first game, there’s also a port of a very old Sega arcade game, which will earn you bonus credits. 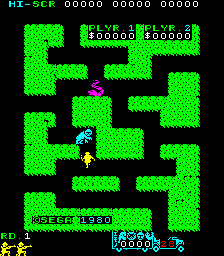 This time it’s Tranquilizer Gun, published in 1980, where you control a hunter in the jungle who must track down various wild animals, sedate them with your rifle, and drag them back to your truck for points. 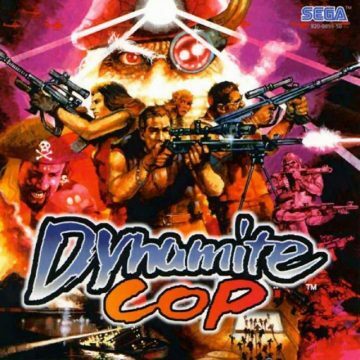 Its political incorrectness is an interesting throwback to an earlier era.